Programs of exercise in all forms and dimensions are available in a range of venues within Brookline, from the Senior Center itself to numerous private health clubs, many of which offer special discounted rates for seniors. While a regular program of exercise can help increase strength, mobility, cardiovascular health, and balance, it is advisable to consult with your physician before beginning any program of exercise. Brookline Senior Center (617-730-2777) offers a variety of activities – among them a walking group called the Senior Solemates, gentle chair exercises, yoga, zumba, supervised sessions on exercise machines, and line dancing. Brookline Adult and Community Education Program (617-730-2700) offers a variety of exercise and strength-training classes for older adults throughout the year. Many of the BACEP classes are held at the Brookline Senior Center. 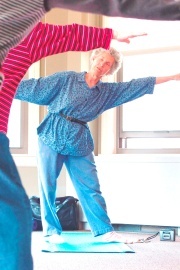 Class offerings include Senior Stretch, Strength Training for Seniors, Yoga for Older Adults and Tai Chi Chuan. Contact BACEP directly for a more complete listing or to register for a class. Brookline Recreation Department (617-730-2069) Offers a variety of activities including swimming, aquatic exercises, tennis, nature walks, theater trips, and golf for individuals of all ages. Some activities are in collaboration with the Brookline Senior Center. An organization for energetic individuals who enjoy the camaraderie of year-round activities, including bicycling, skiing, hiking, golfing and other social gatherings for members. A membership application is available on the club's website. Road Scholar (800-454-5768) is the new program name for Elderhostel, Inc. It offers nearly 8,000 educational tours in all 50 states and more than 90 countries. Road Scholar has been the not-for-profit leader in educational travel since 1975.